Between May 12th and May 30th 2003, during a series of eight recording sessions, I played (and played with) these marvelous songs, many of which were no doubt born on this very instrument. Since I play purely by ear and by instinct, none of these arrangements was written down or even (with the exception of the basic structure of "My Favorite Things") premeditated. We'd turn on the machines and for a couple of hours I'd call out one Rodgers title after another and improvise wildly different versions as the spirit moved me. Then came the task of deciding which version of each song to include. I chose those takes in which I felt I'd responded in the most intuitive and spontaneous way to the instrument itself. I also tended to choose those where the song was at least somewhat recognizable (though there is a dissonant, nearly 12-tone version of "If I Loved You" that was tempting...) What you hear are all single takes. There was no overdubbing, no editing of takes together for perfection's sake. This is exactly what happened in the moment in what turned out to be a deeply rewarding collaboration – a collaboration with Richard Rodgers' piano. Can a musical instrument be infused with the spirit of the person who played it for decades? 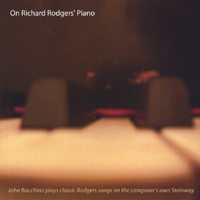 You may find yourself pondering that question as you enjoy On Richard Rodgers's Piano, a new CD that features the contemporary songwriter John Bucchino playing Rodgers melodies on a Steinway that the legendary composer purchased in 1939 and on which he wrote much, if not most, of his greatest music. The instrument is currently owned by Adam Guettel, Rodgers's grandson and an important musical theater composer in his own right. Bucchino had the brilliant idea of using it to make a recording of indelible tunes that R.R. crafted for songs that he wrote in collaboration with Lorenz Hart and Oscar Hammerstein II, the master lyricists who were his long-term partners at two different stages of his career. The resulting CD is much more than a curiosity; in fact, it's one of the best recordings to cross my desk in months. To quote Guettel, "Here is great beauty and humor and understanding, as if Rodgers and Bucchino are friends who never met, united by a lovely old piano." The disc is pleasantly surprising in at least two respects. First, it's something of a revelation to me that Rodgers' melodies stand up so well in performances that have an ad-lib, free-form quality to them; R.R. was a stickler for his songs being sung exactly as written in his shows, but I suspect that he'd be pleased with the highly creative way in which they've been reconceived here for presentation as stand-alone instrumental pieces. The other revelation is the excellence of Bucchino's playing. I've heard him accompany himself and other singers on several occasions but his work at the keyboard never seemed as skilled, sensitive, and soulful as it does here. This is all the more impressive since, as Bucchino admits in the CD booklet's notes, he plays "purely by ear and by instinct." For that reason, he informs us, "none of these arrangements was written down or even (with the exception of the basic structure of 'My Favorite Things') pre-meditated." Wow! A great first impression is made by track #1 of the disc, an exquisite rhapsody on the melodies of "Do-Re-Mi" ("Let's start at the very beginning" -- get it?) and "The Surrey With the Fringe on Top." Up next is that "pre-meditated" version of "My Favorite Things," which starts out as a jazz waltz and goes on from there, full of ear-catching moments. It's hard to pick favorites among the ensuing tracks; in songs ranging from "Isn't it Romantic?" to "It Might as Well Be Spring" to "You Took Advantage of Me," Bucchino deftly manages to interpret these standards without distorting the melodic or harmonic structure of the music as written. Also persuasively covered are "My Romance," "The Lady is a Tramp," "Where or When," "If I Loved You," and "My Funny Valentine." One or two cuts are worthy of special note. Bucchino plays "Edelweiss" from The Sound of Music with such wistful, ethereal beauty that your eyes may well with tears as you listen. (Mine certainly did.) And then there's "Something Good," a love ballad that was written expressly for the film version of The Sound of Music after the death of Hammerstein. Shorn of Rodgers's own problematic lyrics ("Perhaps I had a wicked childhood, perhaps I had a miserable youth," etc. ), the song is revealed to have one of his loveliest melodies. Composers are not always the finest interpreters of other people's music; for proof, just listen to Leonard Bernstein conduct Carmen or La Bohème. In contrast to those willful, idiosyncratic performances, On Richard Rodgers' Piano succeeds because John Bucchino brings his own artistry to these immortal songs while showing due respect for them and for the genius who wrote them. Yes, I know I wrote about Richard Rodgers two weeks ago, but it's not my fault if his presence continues to grow so palpably 25 years after his death. Rodgers' work has always been a favorite of interpreters. Jazz pianist Fred Hersch did a wonderful album based on Rodgers and Hammerstein a few years back. Classical pianist Stephen Hough, the only "interpretive" artist to have won a MacArthur "genius" grant, has included some dazzling Rodgers transcriptions on his two recent albums of pianistic bonbons. Now comes the superb contemporary songwriter John Bucchino, whose work has been recorded by singers as diverse as Judy Collins, Barbara Cook, Art Garfunkel, Patti LuPone and Audra MacDonald. Bucchino has recorded a series of impressions of Rodgers' work on Rodgers' own piano, a 1939 Steinway now owned by Rodgers' grandson, the abundantly gifted composer Adam Guettel. Titled "On Richard Rodgers' Piano," the album contains a dozen improvisations on his melodies, many of which were composed on this piano and all of which were recorded in one take without overdubbing or editing. The results are illuminating. Rodgers hated artists taking liberties with his work. So he might have been unhappy about the way Bucchino alters the rhythms of his songs, as he does in "My Funny Valentine." But the minor alterations only point up the elegance of the melodic line. Not hearing the words, of course, enhances one's sense of the beauty of the tunes, but, ultimately, you cannot hear these songs without thinking of the words. In some cases you have a new respect for them, as I did with Hammerstein's courageous use of repetition in "How I loved you/If I loved you." In the hubbub of the Rodgers centenary, much was made of his alcoholism and coldness. What these artful improvisations stress is a melting tenderness, absent perhaps in life, but abundant in his work. A few years ago, we celebrated what would have been the centennial of Richard Rodgers' birthday. As a result, a veritable typhoon of recordings flooded the market devoted to his works to the point of over saturation. Thankfully, enough time has elapsed for this listener, at least, to wade back into the songs crafted by one of musical theater's greatest composers, since a remarkable album has arrived from the most unlikeliest of sources: John Bucchino, a composer whose works are usually in a syncopated vein not in keeping with Rodgers' more romantic style. Bucchino, however, is full of surprises in On Richard Rodgers' Piano, an instrumental album that features Bucchino performing melodies written by Richard Rodgers on a Steinway he purchased in 1939, and on which he wrote many of his greatest creations. As filtered through Bucchino, the tunes have a free-flowing improvised feel (no small wonder, as Bucchino admits that none of the arrangements were written down, and only one of them, "My Favorite Things," was even pre-meditated before the recording). By turns jazzy (the slightly discordant "The Lady is a Tramp" and the highly infectious "My Favorite Things"), delicate (the ethereal "Edelweiss," which evokes the image of a tender lullaby) and a surprisingly touching "Something Good,” (one of the few songs for which Rodgers contributed both music and lyrics), and wistful (a lilting "It Might as Well Be Spring"), On Richard Rodgers' Piano displays not only a side to Bucchino not previously displayed, but an appreciation for the genius Rodgers showed for melodies. If CD's wear out then I'm in trouble because I've listened to this constantly since receiving it. I keep hearing new values so it keeps getting better! Fantastic! John does it again! What a brilliant musical mind at work! MAGICAL....FANTASTICAL!!! John Bucchino has done it again. He will make you laugh, cry and SMILE with this fabulous interpretation of Richard Rodger's music, played on Richard Rodger's very own Steinway! This CD is PRICELESS. BUY IT NOW and you will be grateful. I told John Bucchino that he was the reincarnated Brahms and I was right! "If I Loved You" is priceless. Unbelievably expressively played by a man that obviously KNOWS what it means to be shy at the beginning of a love affair, and truly, deeply, passionately in love during it. Bravo, John Bucchino! The whole CD is a gorgeous work of art, and I was right on the money when I told you that you were indeed, the 21st century reincarnated Brahms. Gorgeous. Thank you for this brilliant music. A fabulous new take on fabulous R. Rodgers tunes! I have had the pleasure of singing Richard Rodgers tunes for EVER, but hearing these new takes on the standards is just the best. What a great way to make them fresh and new again. Beautifully thought out and played by the wonderful John Bucchino.